Looking down from a drone or at an aerial photo, sugar pine (Pinus lambertiana) stands out from its neighbors. It resembles a star or octupus. Branches stick out laterally and needles occur in short bundles of five. Ponderosa pine, a common neighbor, has three much longer needles and it is noticeably more compact. These differences can be used to discriminate between the two tree species even from the next ridge over. Distribution range of sugar pine. The widest part of sugar pine’s range is along the Oregon-California border, where it is lightly scattered throughout much of our unique and famously diverse Klamath Mountains. They grow north as far as Eugene, but just barely. Sugar pine trees lack the tolerance for cold fall events in the Willamette Valley, where Douglas-fir and Western hemlock are better adapted. To the south of our region, stands rapidly diminish to a few small secluded and disjointed populations scattered in the higher elevations of the Mexican Sierras. However, the most dense and extensive stands occur north of the Red Butte Mountains, within the Red Buttes Wilderness in far northern California, and southwest of Applegate Lake in Oregon. Erosion of the Red Buttes, consisting of granitics, seafloor metamorphics, and peridotite (mantle rock), has provided a rich, deep, slightly basic (alkaline) mixture of soils, perfect for sugar pine. The Buttes (around 7000 feet in elevation) scrub the clouds of moisture keeping the soils saturated early in the growing season. 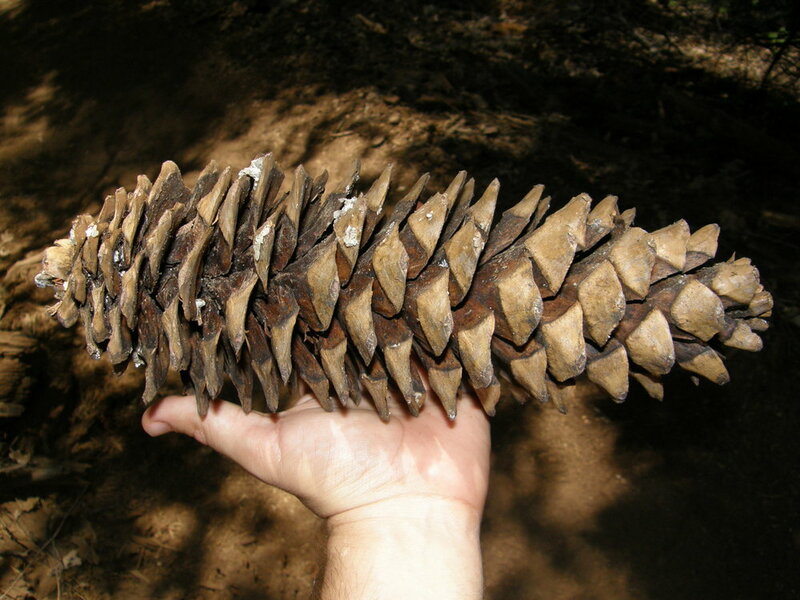 Sugar pine cones can grow up to 18 inches, but average a foot long. Photo courtesy of Flickr Creative Commons. Sugar pine is actually sugary. Its sap is sticky-sweet and its large seeds, often sold as pine nuts, are yummy. The kernels are lodged on the scales inside the longest conifer cone found anywhere in the world. They grow up to 18 inches, but average about one foot. However, the massive cone is still lighter than the resinous 13 pound Coulter pine cone. In either case, unless you’re fast, it’s a good idea not to linger under the trees during the fall squirrel harvest. Being hit by one of these cones can cause serious personal injury. But northwest squirrels are weak and have notoriously poor aim. The big seeds contain enough energy to provide an initial germination advantage over Douglas-fir and Ponderosa pine. But, both competitors are more tolerant of hot, dry soil and shallow water reservoirs. Where sugar pine repeatedly wilts and gradually dies, Ponderosa pine prospers. Foresters see sugar pine as an indicator of deep moist soils and high commercial biomass production. This sugar pine, found in California, made it on the list of American Forests Champion Trees in 2016. It is the largest known tree of its species in the country. Check out Champion Trees National Register to view more champions and submit nominees. Where sugar pine occurs with Douglas-fir or ponderosa pine, it is usually the largest tree in the stand. It can be one quarter to one third larger. In the Red Buttes, trees with a diameter of eight feet (about 300 inches in circumference) can be found, but rarely. Although noticeably larger, they are usually similar in age as their neighbors. The ability of sugar pine trees to store processed sugars allow them to continue to produce wood later in the summer while their neighbors become dormant. Banner photo courtesy of Flickr Creative Commons. Older PostWe did it! 80 Acres along the East Fork Illinois River, Conserved Forever!